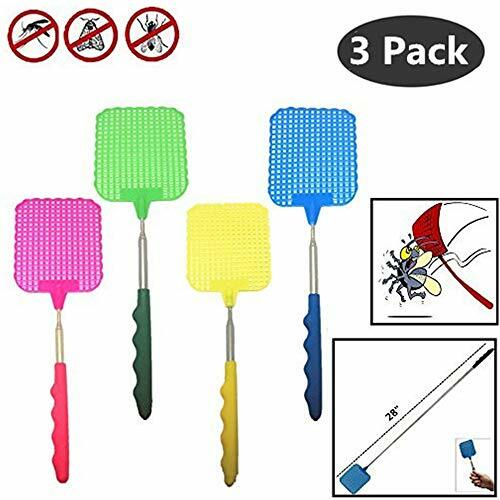 3 Packs Fly Swatter, Portable and Durable Mosquito Bug Killer with Strong & Flexible Plastic Surface and Telescopic Handle - 3 Colors Material Surface: eco-friendly, strong and flexible plastic. Stick: sturdy stainless steel. Handle: non-slip telescopic rubber. Colors 3 packs. 3 colors: red, blue and orange with beautiful butterfly pattern in it. Lightweight and easy to use & storage. Good flexibility ,it is small enough to stick in your car. Ideal to take on trips. Use it to remove spiders ,wasps and bugs around your home, office, workshop or campsite.Long enough to swat flies even though in a long distance. If you have any questions about this product by TSY TOOL, contact us by completing and submitting the form below. If you are looking for a specif part number, please include it with your message.